The German penchant for straight pool was evident in the final of the World 14.1 Straight Pool Championship, in which Thorsten Hohmann defeated his fellow countryman Thomas Engert, 200-80. The first tournament of its kind in over 15 years, the World 14.1 Straight Pool Championship took place over six days, from May 30 to June 4 at the Hilton in East Brunswick, N.J., attracting an international field of 64 players. Hohmann topped the list of high runs with 174, and tore through the bracket in the double-elimination second round and single-elimination final. In the first round, a round-robin format among eight groups of eight players, Hohmann survived the elimination of half the field with a record of five wins and two losses, to John Schmidt and Allen Hopkins, respectively. In the second round, among 32 players, Hohmann remained on the winners’ side with wins over Antonio Fazanes, 150-68, and Charlie Williams, 150-14. With only the top 16 advancing to the third and final round, Hohmann defeated everyone in his path. He avenged his first loss to Schmidt with a 200-64 win, then went on to beat Austrian “Ice Princess” Jasmin Ouschan, 200-117, and came out on top of a tight match against Max Eberle, 200-177 to land in the final with Engert. Engert had a tough road to the finals, losing to Allen Hopkins in the second round, but making it into the top 16 with a win over Vilmos Foldes, 150-45, on the one-loss side. In the final round, he matched up against some formidable straight pool opponents, including Bobby Hunter, who he barely bested, 200-177, straight-pool veteran Allen Hopkins, 200-32, and Mika Immonen, 200-80. The all-German final saw Hohmann ahead for the entire match, jumping out to a 160-49 lead. Engert was able to narrow the gap to 80, but missed the 15 in the side pocket after leaving the cue ball burrowed into a stack of balls. Hohmann ran out the next two racks for the win. DUISBURG, Germany, July 20 — The billiard portion of the 2005 World Games kicks off today with men competing in three disciplines (carom, snooker and 9-ball) and women in 9-ball only. Rodney Morris and Charlie Williams will represent the U.S. in 9-ball on the men’s side, and Vivian Villarreal will cue up for the American women. The finals in all four groups will be played on Sunday, July 24. 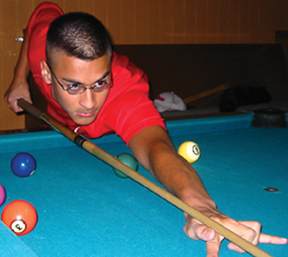 Billiards Digest staff will have regular updates here on Headstring News from the competition. From July 14-24 at the World Games, Duisburg and partner cities Bottrop, Oberhausen and Mülheim an der Ruhr are expected to welcome 500,000 spectators in 27 venues, plus host the over 3,500 athletes from 100 nations who will compete in 40 sports and 177 disciplines. As round-robin play at the World Pool Championship draws to a close, some big names are arranging for flights out of Kaohsiung, Taiwan. Top performers like Mosconi Cup veterans Ralf Souquet (Germany) and Charlie Williams (USA) are packing their bags, and Steve Davis (England) and Filipino legend Efren Reyes are hanging on by a mathematical thread. The ranks of the undefeated include Johnny Archer (USA), the Philippines’ Marlon Manalo, Taiwanese hopes Po-cheng Kuo and Che-wei Fu, Japan’s Satoshi Kawabata and Scottish challenger Michael Valentine. There’s one more day to go in the round-robin stage, which pares the 128-man field to 64 players, who then will brave the single-elimination stage.